Shrubby habit or will climb with support. Reddish-purple, sparsely thorny stems and purple flushed, dark green leaves. 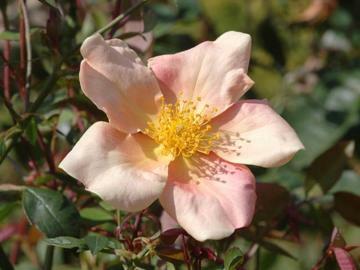 Smallish cup-shaped single flowers which open pale yellow, ageing to orange-yellow, copper-pink, deep pink and then finally dusky pinkish-purple.